The aim of this work was to compare treatment intensification strategies based on orally administered vs injectable incretin-based antihyperglycaemic agents in patients with type 2 diabetes mellitus on metformin monotherapy. In a 26 week, open-label study, 653 patients (baseline HbA1c = 8.2% [66 mmol/mol]) were randomised at 111 sites in 21 countries in a 1:1 ratio to a strategy using oral agents (starting with sitagliptin 100 mg/day) or a strategy using the injectable drug liraglutide starting at a dose of 0.6 mg/day, up-titrated to 1.2 mg/day after 1 week. The following patients with type 2 diabetes mellitus were recruited for the study: those aged 18–79 years, on a stable dose of metformin monotherapy ≥1,500 mg/day for ≥12 weeks, with an HbA1c ≥7.0% (53 mmol/mol) and ≤11.0% (97 mmol/mol) and a fasting fingerstick glucose (FFG) <15 mmol/l (<270 mg/dl) at the randomisation visit, deemed capable by the investigator of using a Victoza pen injection device (containing 6 mg/ml liraglutide; Novo Nordisk, Bagsværd, Denmark). Women taking part in the study agreed to remain abstinent or use an acceptable method of birth control during the study. Randomisation was performed via a computer-generated allocation schedule using an interactive voice response system. After 12 weeks, patients on sitagliptin with HbA1c ≥ 7.0% (53 mmol/mol) and fasting glucose >6.1 mmol/l had their treatment intensified with glimepiride; patients on liraglutide with HbA1c ≥ 7.0% (53 mmol/mol) had the dose up-titrated to 1.8 mg/day. The primary analysis assessed whether the strategy using oral drugs was non-inferior to that using an injectable drug regarding HbA1c change from baseline at week 26 using a per-protocol (PP) population and a non-inferiority margin of 0.4%. In the PP population (522 patients included: oral strategy, n = 269; injectable strategy, n = 253) antihyperglycaemic therapy was intensified at week 12 in 50.2% and 28.5%, respectively. HbA1c decreased over 26 weeks in both treatment strategy groups, with a larger initial reduction at week 12 in the injectable strategy group. The LS mean change in HbA1c at week 26 was −1.3% (95% CI −1.4, −1.2) in the oral strategy group and −1.4% (95% CI −1.5, −1.3) in the injectable strategy group; the study met the non-inferiority criterion. Both treatment regimens were generally well tolerated; hypoglycaemia was reported more often with the oral strategy, while nausea, vomiting, diarrhoea and abdominal pain were reported more often with the injectable strategy. An oral, incretin-based treatment strategy with sitagliptin and, if needed, glimepiride may be a good approach in many patients with type 2 diabetes mellitus for managing inadequate glycaemic control on metformin monotherapy, as compared with an injectable treatment strategy with liraglutide. The oral and injectable strategies had similar effects on HbA1c and had good overall tolerability. Funding The study was sponsored by Merck Sharp & Dohme Corp., a subsidiary of Merck and Co., Inc., Whitehouse Station, NJ, USA. The online version of this article (doi: 10.1007/s00125-013-2905-1) contains peer-reviewed but unedited supplementary material, which is available to authorised users. Metformin is the recommended first-line antihyperglycaemic therapy for most patients with type 2 diabetes mellitus . Due to the progressive nature of this disease, additional antihyperglycaemic agents are often needed to attain and/or maintain glycaemic control [2, 3]. There is no specific guidance for the recommended second- or, if needed, third-line antihyperglycaemic therapy to achieve glycaemic goals. This is due, in part, to the many factors that clinicians need to consider when selecting additional antihyperglycaemic therapies, including efficacy, side-effects profile (e.g. hypoglycaemia, weight gain and gastrointestinal intolerance), drug costs, modality (e.g. oral vs injectable) and the patient’s characteristics and/or comorbid state (e.g. age, renal function, pre-existing cardiovascular disease) . Furthermore, the general lack of comparative effectiveness research in this area limits the development of consensus opinions. Thus, there is a significant need for comparative effectiveness research on potential sequences of escalating glucose-lowering therapy beyond metformin . Incretin-based therapies, dipeptidyl peptidase-4 (DPP-4) inhibitors and glucagon-like peptide-1 receptor agonists (GLP-1RAs) are relatively new antihyperglycaemic agents in the diabetes armamentarium for clinicians . DPP-4 inhibitors and GLP-1RAs have both been shown to significantly improve glycaemic control and to be generally well tolerated when added to ongoing metformin therapy . In head-to-head, add-on-to-metformin trials, treatment with GLP-1RAs led to better glycaemic control and weight loss, but had greater gastrointestinal side effects, than the DPP-4 inhibitor sitagliptin [6, 7]. Such head-to-head clinical trials were used to compare the efficacy and safety of GLP-1RAs with those of sitagliptin used on top of metformin. However, from a long-term perspective, evaluating sequences of escalating glucose-lowering therapy beyond metformin on achievement of glycaemic goal may be more applicable and relevant to a real-world setting. Treatment intensification strategies include sequential addition of antihyperglycaemic agents or up-titrating or optimising the dose when a glycaemic goal is not met. 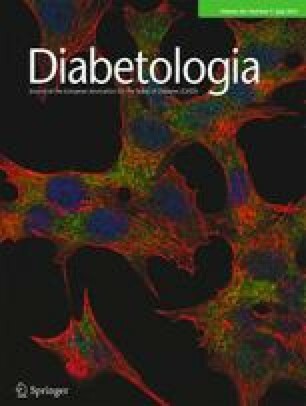 The present study was designed not to compare liraglutide with sitagliptin, but rather to compare the efficacy and safety of treatment strategies based on oral vs injectable incretin-based antihyperglycaemic agents in patients with type 2 diabetes mellitus who have inadequate glycaemic control on metformin monotherapy. The strategy based on oral treatment added sitagliptin to ongoing metformin monotherapy and then, if the glycaemic goal was not achieved, a sulfonylurea agent was added. The injection-based strategy added liraglutide to metformin monotherapy and then, if the glycaemic goal was not achieved, the dose of liraglutide was up-titrated. All patients provided written informed consent. The following patients with type 2 diabetes mellitus were recruited for the study: those aged 18–79 years, on a stable dose of metformin monotherapy ≥1,500 mg/day for ≥12 weeks, with an HbA1c ≥ 7.0% (53 mmol/mol) and ≤11.0% (97 mmol/mol) and a fasting fingerstick glucose (FFG) <15 mmol/l (<270 mg/dl), deemed capable by the investigator of using a Victoza pen injection device (containing 6 mg/ml liraglutide; Novo Nordisk, Bagsværd, Denmark) . Women taking part in the study agreed to remain abstinent or use an acceptable method of birth control during the study. Patients were excluded if they had type 1 diabetes mellitus, a history of ketoacidosis, uncontrolled hypertension, new or worsening signs/symptoms (within past 3 months) of cardiovascular disease, presence of severe active peripheral vascular disease, a history of hypersensitivity or any contraindication to the antihyperglycaemic agents used in the present study or been treated with any antihyperglycaemic therapy other than metformin monotherapy within the 12 weeks before the screening visit. Additional exclusion criteria were a history of malignancy or clinically important haematological disorder that required disease-specific treatment, a personal or family history of medullary thyroid carcinoma or multiple endocrine neoplasia syndrome type 2, an elevated serum creatinine value (≥124 μmol/l [1.4 mg/dl] for men and ≥115 μmol/l [1.3 mg/dl] for women), an estimated glomerular filtration rate (eGFR) <60 ml min−1 (1.73 m)−2 or an alanine or aspartate aminotransferase level >2 times the upper limit of the normal range. Patients were required to be weight stable and receive counselling on a weight-maintaining diet consistent with local guidelines throughout the study. This 26 week, multinational, randomised, open-label, active-controlled, parallel-arm study was conducted at 111 clinical sites in 21 countries. The redacted protocol for this study is shown in the electronic supplementary material (ESM) and it was performed in accordance with principles of Good Clinical Practice and was approved by the appropriate institutional review boards and regulatory agencies. The study was conducted from 14 March 2011 to 29 February 2012. Eligible patients had baseline measurements taken and then were randomised in a 1:1 ratio to an oral or an injectable treatment strategy. Randomisation was performed via a computer-generated allocation schedule and via an interactive voice response system. Sitagliptin was given in a dose of 100 mg/day and liraglutide was, as per label , initiated at 0.6 mg/day for the first week and then up-titrated to 1.2 mg/day in all patients. After 12 weeks, patients in the oral strategy group with an HbA1c ≥ 7.0% (53 mmol/mol) and FFG > 6.1 mmol/l (110 mg/dl) had glimepiride added to their treatment regimen for an additional 14 weeks. After 12 weeks, patients in the injectable strategy group with an HbA1c ≥7.0% (53 mmol/mol) had the liraglutide dose, as per label, up-titrated to 1.8 mg/day (ESM Fig. 1). Glimepiride was started at 1 mg/day for patients with an FFG > 6.1 mmol/l (110 mg/dl) and <8.3 mmol/l (150 mg/dl) or 2 mg/day for patients with an FFG ≥ 8.3 mmol/l (150 mg/dl) and then up-titrated, at the discretion of the investigator, to a maximum dose of 6 mg/day over a 3 week period. The glimepiride dose could be down-titrated, interrupted or discontinued by the investigator for unexplained episodes of hypoglycaemia. Treatment compliance was assessed by patient report. Patients were to be discontinued because of hypoglycaemia if the following criteria were met: (1) they had repeated fasting plasma glucose (FPG) or fingerstick glucose values <2.8 mmol/l (50 mg/dl) with or without symptoms; (2) FPG or fingerstick glucose ≤3.9 mmol/l (70 mg/dl) with symptoms and without a reasonable explanation (for glimepiride-treated patients, if these episodes occurred after interrupting glimepiride). Patients were to be discontinued because of hyperglycaemia if the following criteria were met: (1) FPG (with value repeated and confirmed within 7 days) >15 mmol/l (270 mg/dl) from randomisation through to week 6; (2) FPG > 13.33 mmol/l (240 mg/dl) after week 6 through to week 18; FPG > 11.11 mmol/l (200 mg/dl) after week 18 through to week 26. The primary efficacy endpoint was a change in HbA1c value. Other efficacy endpoints were FPG and plasma lipids (total cholesterol, LDL-cholesterol, HDL-cholesterol and triacylglycerols). The percentage of patients at HbA1c goals (<7.0% [53 mmol/mol] and <6.5% [48 mmol/mol]) was assessed. The primary time point of the study was week 26. Safety was assessed via review of reports of adverse events (AEs), physical examination, vital signs and body weight. Hypoglycaemia and specific gastrointestinal AEs were of particular clinical interest. For hypoglycaemia, patients were counselled with regard to the symptoms, fingerstick evaluation, treatment and reporting. Any episode considered likely to represent symptomatic hypoglycaemia by the investigator was to be captured as an AE of symptomatic hypoglycaemia. This diagnosis did not require confirmatory blood glucose results. Further, at the discretion of the investigator, an asymptomatic blood glucose value ≤3.9 mmol/l (70 mg/dl) could be reported as an AE of asymptomatic hypoglycaemia. Hypoglycaemia was classified as severe if a patient required medical or non-medical assistance or exhibited a markedly depressed level of consciousness (including loss of consciousness or seizure). Gastrointestinal AEs of interest were nausea, vomiting, diarrhoea, constipation, dyspepsia and a composite abdominal pain endpoint (consisting of abdominal pain, upper or lower abdominal pain and abdominal or epigastric discomfort). Blood samples for efficacy and safety laboratory variables were collected after patients were fasted overnight for at least 12 h. All laboratory measurements were performed at central laboratories (PPD Global Central Labs, Highland Heights, KY, USA and Zaventem, Belgium). The primary efficacy analysis assessed whether the oral strategy was non-inferior to the injectable strategy regarding HbA1c change from baseline at week 26. The primary population was the per-protocol (PP) population, consisting of all randomised patients with HbA1c measurements at baseline and week 26, and no major protocol violations. An analysis of covariance (ANCOVA) was used to compare the HbA1c change from baseline at week 26 between treatment strategies. The analysis included a fixed-effect term for treatment and a covariate for the baseline HbA1c value. Non-inferiority was to be declared if the upper bound of the two-sided 95% CI for the between-group difference in least squares (LS) mean change from baseline in HbA1c (oral strategy minus injectable strategy) was less than 0.4% (non-inferiority margin). A sample size of 600 patients provided 90% power (two-sided, α = 0.05) to test the primary hypothesis (non-inferiority in HbA1c-lowering efficacy between treatment strategies). This was based on the following assumptions: a standard deviation for HbA1c of 1.0%; a PP population size of 240 patients per group and a true treatment difference of 0.1%. Analysis of change from baseline in FPG and plasma lipids, except triacylglycerols, used a similar ANCOVA model, except the covariate was the baseline value of the variable of interest. Triacylglycerols were analysed using a nonparametric method. For this analysis, within-treatment effects were estimated using medians and the between-group effects were estimated using the Hodges–Lehmann estimate  with a corresponding distribution-free 95% CI based on Wilcoxon’s rank sum test. Supportive glycaemic efficacy analyses were performed in the full analysis set (FAS) population, which included all randomised patients who had a baseline measurement and at least one post-baseline measurement, and used a longitudinal data analysis model. Analysis of the percentage of patients with HbA1c < 7.0% (53 mmol/mol) and <6.5% (48 mmol/mol) at week 26 was conducted using the Miettinen and Nurminen method . Analyses of AEs included all randomised patients who took at least one dose of study medication. Symptomatic hypoglycaemia AEs and selected gastrointestinal AEs were pre-specified safety variables. For these variables, p values and 95% CIs for between-treatment-regimen differences for incidence were calculated using the Miettinen and Nurminen method . Summary statistics and 95% CIs for between-group differences were calculated for summary AE measures and individual AEs when at least four patients experienced the event in at least one treatment group. AEs with an incidence ≥1% in either group were summarised. Post hoc analyses of change from baseline in body weight, pulse rate, systolic blood pressure and diastolic blood pressure were performed using the aforementioned ANCOVA model and included all randomised patients who had measurements of the respective endpoint at baseline and week 26. In this study, 653 patients were randomised (oral strategy, n = 326; injectable strategy, n = 327). Treatment groups were generally well balanced for baseline demographics and efficacy variables for all randomised patients (Table 1). In the PP population, the baseline demographic and efficacy variables were similar to those of the randomised cohort, with a mean age of 57 years, a median duration of known diabetes of 6 years, a mean HbA1c of 8.2% (66 mmol/mol) (range: 6.4% [46 mmol/mol] to 11.5% [102 mmol/mol]) and mean FPG of 9.7 mmol/l (175 mg/dl). Of the 653 randomised patients, 532 completed the study (oral strategy, n = 275; injectable strategy, n = 257) (Fig. 1). More patients discontinued treatment in the injectable strategy group than in the oral strategy group; this difference was mainly because of a higher number of discontinuations due to an AE in the injectable strategy group. The majority of the patients who discontinued due to ‘other’ reasons did so because they met pre-specified laboratory discontinuation criteria. At week 12, antihyperglycaemic therapy was intensified based upon glycaemia levels by adding glimepiride in 47.2% of patients in the oral strategy group (at study end, the mean dose of glimepiride was 3.1 mg/day) or by up-titrating liraglutide to 1.8 mg/day in 25.0% in the injectable strategy group. In the PP population, 522 patients were included (oral strategy, n = 269; injectable strategy, n = 253). Of the 131 patients excluded from the PP analysis, 122 (93%) did not have week 26 measurements. For the PP population, antihyperglycaemic therapy was intensified at week 12 in 50.2% of patients in the oral strategy group and 28.5% in the injectable strategy group. In the PP population, HbA1c decreased over 26 weeks in both treatment strategy groups, with a larger initial reduction at week 12 in the injectable strategy group (Table 2). The LS mean change in HbA1c at week 26 was −1.3% in the oral strategy group and −1.4% in the injectable strategy group. The upper bound of the two-sided 95% CI for the difference in LS mean change from baseline in HbA1c (0.2%) was less than the pre-specified non-inferiority margin of 0.4%. Thus, the primary hypothesis was met to declare that the oral strategy was non-inferior to the injectable strategy in lowering HbA1c at week 26. The proportion of patients with HbA1c < 7.0% (53 mmol/mol) at week 26 was lower in the oral strategy group than in the injectable strategy group (62.8 vs 72.3%, respectively; difference in proportions [95% CI] −9.5% [−17.4, −1.5]). The proportion of patients with HbA1c < 6.5% (48 mmol/mol) at week 26 was 33.8% in the oral strategy group and 38.3% in the injectable strategy group (difference in proportions [95% CI] = −4.5% [−12.7, 3.7]). Significant reductions in FPG at week 26 were observed in both groups, with a greater reduction observed in the injectable strategy group (Table 2). Glycaemic efficacy results in the FAS population were consistent with those in the PP population (data not shown). No meaningful between-group differences were found in any lipid variable (ESM Table 1). For within-group changes, small increases in total cholesterol, HDL-cholesterol and LDL-cholesterol were observed in the oral strategy group and a small increase in HDL-cholesterol was observed in the injectable strategy group. A reduction in triacylglycerols relative to baseline was observed in both groups. After 26 weeks, no meaningful differences between groups were observed in the incidence of clinical AEs overall but the incidence of drug-related AEs or AEs leading to discontinuation was greater in the injectable strategy group than in the oral strategy group (Table 3). These differences were mainly related to the significantly higher incidence of gastrointestinal AEs, such as abdominal pain, diarrhoea, nausea and vomiting, in the injectable strategy group (Table 3). As expected with the use of a sulfonylurea, the incidence of symptomatic hypoglycaemia was significantly greater in the oral strategy group than in the injectable strategy group (Table 3). In the first 12 weeks, before intensification of therapy, there were six patients in the oral strategy group and eight patients in the injectable strategy group who reported experiencing a hypoglycaemic event; after intensification of therapy, there were 36 patients in the oral strategy group and seven patients in the injectable strategy group who reported experiencing a hypoglycaemic event. Thirty-three of the 36 patients in the oral strategy group received glimepiride. In both groups, most patients with symptomatic hypoglycaemia experienced one episode; nine patients in the oral strategy group compared with four in the injectable strategy group experienced two episodes and nine patients in the oral strategy group compared with two in the injectable strategy group experienced three or more episodes. All episodes were generally mild to moderate in intensity, except for one severe episode that required medical assistance in each group. The proportion of patients with asymptomatic hypoglycaemia (no symptoms of hypoglycaemia, but a fingerstick glucose ≤3.9 mmol/l [70 mg/dl]) was similar in the oral strategy (1.2%) and the injectable strategy (1.5%) group. One patient in the injectable strategy group discontinued treatment due to hypoglycaemia. One patient in the oral strategy group died as the result of an accident during the study. The overall incidence of AEs by system organ class (SOC; see www.meddramsso.com/) was comparable between groups, except for a higher incidence of AEs in the gastrointestinal disorders SOC (32.7% vs 10.7%) and the skin and subcutaneous tissue disorders SOC (4.3% vs 0.9%) in the injectable strategy group. As reported earlier, specific gastrointestinal AEs accounted for the between-group difference in the gastrointestinal disorders SOC (Table 3). No specific AE accounted for the imbalance within the skin and subcutaneous tissue disorders SOC. Specific AEs that occurred in at least 1% of patients in either group are listed in ESM Table 2. There were no notable differences between groups in these AEs, except for a greater incidence of decreased appetite in the injectable strategy group. Of the six patients who experienced an AE related to a decrease in glomerular filtration rate (four in the oral strategy group; two in the injectable strategy group), the four patients in the oral strategy group discontinued treatment due to this AE and also met the protocol-defined discontinuation criterion (i.e. eGFR <60 ml min−1[1.73 m]−2) (ESM Table 2). The two patients in the injectable strategy group who experienced this AE also met the protocol-defined discontinuation criterion but were either discontinued because of another AE or experienced the AE at study end. At baseline, the eGFR values for these six patients were generally at or near the discontinuation threshold. In the oral strategy group, no meaningful changes from baseline were observed for systolic or diastolic blood pressure or pulse rate (Table 4). In the injectable strategy group, no meaningful change from baseline was observed for diastolic blood pressure, but a small decrease from baseline in systolic blood pressure and a small increase in pulse rate were observed. Body weight decreased from baseline in both the injectable strategy group and the oral strategy group, with a larger reduction observed with liraglutide (Table 4). In contrast to studies that directly compare antihyperglycaemic agents, the present study compared sequences of escalating glucose-lowering therapy beyond metformin. Selection of antihyperglycaemic agents for treatment intensification depends upon many factors including efficacy, tolerability and drug cost . In the present study, the strategies comprised oral antihyperglycaemic therapies (sitagliptin and, if needed, glimepiride) or injectable therapy (liraglutide 1.2 mg/day with, if needed, up-titration to 1.8 mg/day) added to background metformin therapy. The choice of adding a sulfonylurea as a third oral agent as part of an oral antihyperglycaemic strategy is generally recommended (rather than adding a thiazolidinedione) . Up-titrating liraglutide from 1.2 mg to 1.8 mg/day as part of an injectable antihyperglycaemic strategy, rather than switching to insulin, corresponds to the dosing recommendations as provided on the product label . Protocol-directed treatment intensification at 12 weeks was required in approximately half of the patients in the oral strategy group compared with approximately one-quarter of those in the injectable strategy group. The oral strategy was non-inferior in HbA1c-lowering efficacy after 26 weeks compared with the injectable strategy in patients with type 2 diabetes mellitus and whose glycaemia was inadequately controlled by metformin monotherapy. Nearly two-thirds of patients had an HbA1c <7% (53 mmol/mol) at week 26, with a higher percentage observed in the injectable strategy group. Both strategies were generally well tolerated, with AEs consistent with the agents used within each strategy: more episodes of symptomatic hypoglycaemia were reported in the oral strategy group, in which a sulfonylurea was used in approximately half of the patients, and more gastrointestinal AEs were reported in the injectable strategy group. In a head-to-head clinical trial that directly compared sitagliptin and liraglutide, a greater reduction in HbA1c was observed at 26 weeks with liraglutide . Although not a pre-specified comparison in the present study, there was a difference between sitagliptin and liraglutide 1.2 mg/day in HbA1c reduction at week 12. This is likely attributable to the physiological vs pharmacological levels of GLP-1 receptor activation achieved with sitagliptin and liraglutide, respectively . However, increased GLP-1 receptor activation is associated with a greater incidence of gastrointestinal AEs, as observed both with liraglutide previously  and in the present study. Furthermore, more patients discontinued treatment in the injectable strategy group in the present study, with many discontinuing due to gastrointestinal AEs. There was a greater reduction in body weight observed in the injectable strategy group. This was not unexpected given the known weight-loss effects of GLP1-RAs and the weight-gain effects of sulfonylureas, which were added in about half of the patients in the oral strategy group. The incidence of reports of symptomatic hypoglycaemia was higher in the oral strategy group in this study. In an earlier study comparing sitagliptin and liraglutide as add-on therapy to metformin over 26 weeks, the incidence of hypoglycaemia was low (5%) and similar between treatment groups . Additionally, the incidence of hypoglycaemia in this study was similar in the two treatment groups during the first 12 weeks of the study, but was higher in the oral strategy group during the remainder of the study when glimepiride could be added. Thus, the increase in reports of symptomatic hypoglycaemia was most likely due to the addition of glimepiride in the oral strategy group. This is consistent with the findings of another clinical study in which there was an increased incidence of reports of symptomatic hypoglycaemia when sitagliptin was combined with a sulfonylurea . Overall, the episodes of hypoglycaemia were generally mild to moderate in intensity and no patient in the oral strategy group discontinued because of hypoglycaemia. An episode of severe hypoglycaemia occurred in one patient in each group. Injectable therapies, especially insulin, can be associated with barriers to use. In an internet survey study of US and European patients with type 2 diabetes mellitus who were receiving metformin monotherapy, more patients (>80%) preferred to add an oral medication with a profile resembling sitagliptin than an injectable therapy resembling liraglutide . In contrast, patients preferred an injectable agent (insulin glargine [A21Gly,B31Arg,B32Arg human insulin]) over intensification with oral antihyperglycaemic therapies if greater glycaemic efficacy could be achieved . Previously, greater treatment satisfaction was reported in an open-label study of patients treated with liraglutide 1.8 mg/day (and similarly with 1.2 mg/day), compared with sitagliptin in a head-to-head trial directly comparing these agents . Measures of convenience or flexibility did not differ between treatments, suggesting that the route of administration did not influence overall treatment satisfaction . Given the glycaemic equipoise between groups achieved in the present study, it would have been useful to assess the preference/satisfaction of patients between the two treatment strategies. The following limitations need to be considered when interpreting the present results. The study used an open-label design and thus blinding to treatment was not possible. In addition, the protocol-driven antihyperglycaemic intensification strategy used in this study may not be followed diligently in a real clinical setting. Furthermore, since the duration of this study was only 26 weeks, one cannot comment on the durability of the oral strategy vs the injectable strategy over a longer period of time. A strength of the study is the similar findings between the PP and FAS analyses, which support the robustness of the conclusions. In conclusion, this study compared two commonly used sequences of escalating glucose-lowering therapy beyond metformin, based on incretin-based agents, and showed similar HbA1c efficacy and good tolerability of an oral-based treatment strategy relative to an injectable one. An oral treatment strategy with sitagliptin and, if needed glimepiride, may be a good approach to managing patients with inadequate control on metformin monotherapy compared with an injectable treatment strategy with liraglutide. As patients will require multiple antihyperglycaemic medications to manage their disease, the present results provide information on the appropriate placement of these agents in the treatment of type 2 diabetes mellitus and may assist in the development of future treatment algorithms. The authors would like to acknowledge D. Blazy, J. Chen, B. J. Goldstein, G. Golm, L. Radican, T. Souchet, C. Chanut Vogel and R. Xu (Merck Sharp & Dohme Corp., a subsidiary of Merck & Co., Inc., Whitehouse Station, NJ, USA) for their contributions to this study. The study was sponsored by Merck Sharp & Dohme Corp., a subsidiary of Merck & Co., Inc. (Whitehouse Station, NJ, USA). B. Charbonnel has received board memberships, consulting fees, lecture payments and travel and meeting expenses from the following companies: AstraZeneca, Bristol Myers Squibb, Boehringer-Ingelheim, GlaxoSmithKline, Janssen, Lilly, Merck Sharp & Dohme Corp., Novartis, Novo-Nordisk, Roche, sanofi-aventis and Takeda. H. Steinberg, E. Eymard, L. Xu, P. Thakkar, V. Prabhu, M. J. Davies and S. S. Engel are employees of Merck Sharp & Dohme Corp. and may have stock or stock options in the company. BC, HS, EE and SSE developed the study concept and design. HS, EE and PT acquired the data. LX and VP analysed the data. MJD interpreted the results and wrote the first draft of the manuscript. All authors contributed to the interpretation of the results and to the discussion, reviewed the manuscript and approved the final version.